Heavy downpours flooded homes, roads and farmland in central and southern South Korea on Tuesday, adding to the woes of regions already battered by a typhoon last week. 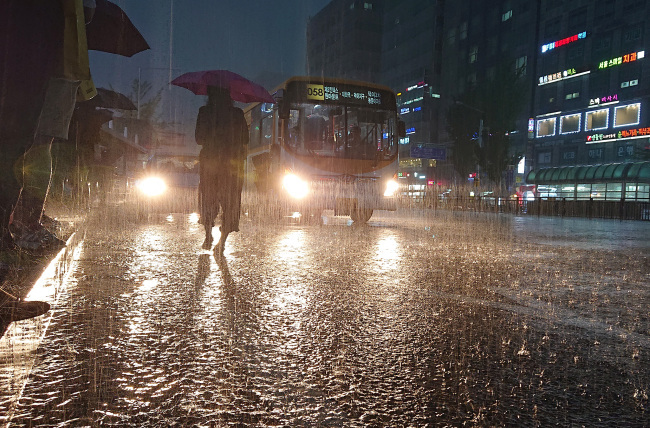 Up to 455 millimeters of rain fell in South Jeolla Province in the country's southwest between Monday and Tuesday, with more than 70 mm falling per hour at some points in some areas, according to the state weather agency. The downpours came after Typhoon Soulik pummeled the regions last week. Local government officials said that the typhoon and torrential rains caused a total of at least 9 billion won ($8 million) in property damage in South Jeolla Province alone. 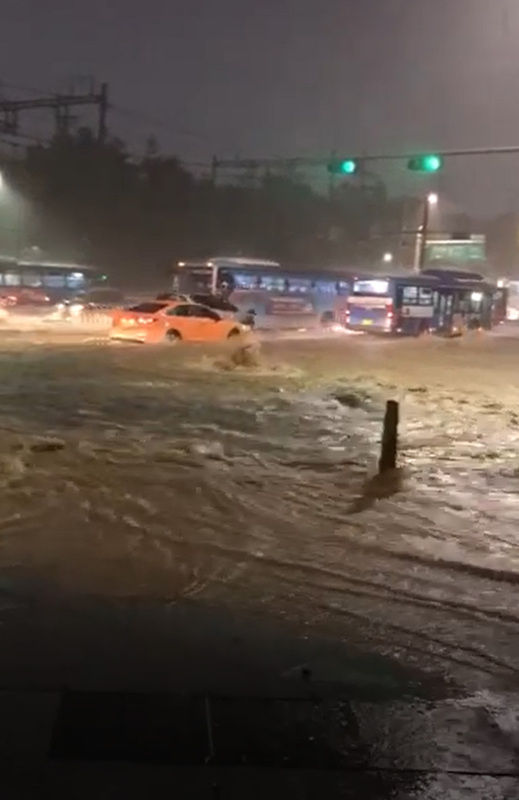 According to the Gwangju city government, overnight rains flooded 132 roads, 91 buildings, 46 homes and 34 vehicles. Also reported were 10 landslides, farmland flooding, embankment damage and power outages, officials said. The central city of Daejeon also reported damage from torrential rain overnight. Officials said at least 30 cases of damage were reported, such as flooding of homes, buildings, parking lots, roads and farmland. The flooding also caused heavy gridlock on key roads during the morning rush hours. 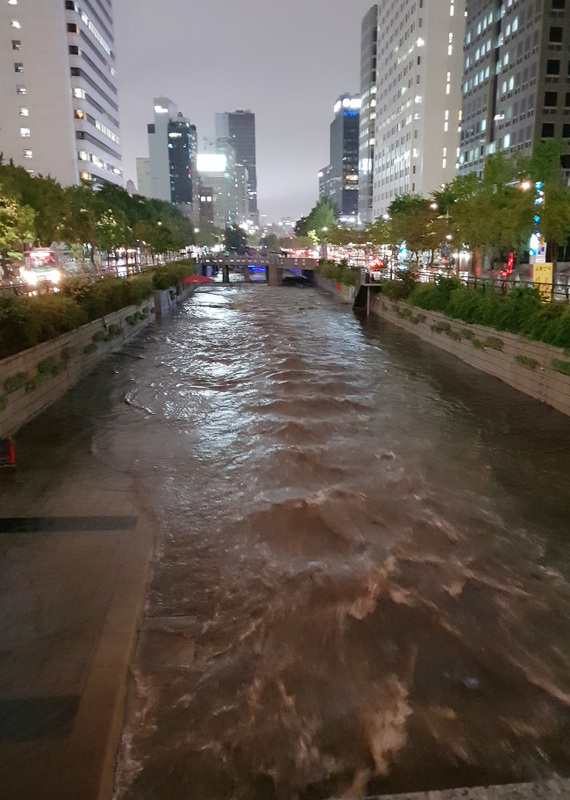 Later in the day, torrential downpours hit the capital city of Seoul and its surrounding areas, causing inconvenience to people during the evening rush hour. Though no major damage has been reported, some 480 sewer overflow cases were reported across the city, according to the disaster relief center. The authorities blocked some major motorways along the tributaries of the Han River due to flood concerns.